Today is Halloween, which is the second most celebrated holiday in the United States. I know there are divergent opinions on Halloween, a holiday which comes from 1- a Celtic celebration of the end of summer, and 2- All Saints' Day, which was a celebration of dead Christians. Many Christians oppose it, many use it as an opportunity for outreach. Whichever your stance, (hopefully you believe enough in Christian liberty to not make too big of a deal about other's opinions) I think we can take some spiritual thoughts from it and can use it for some spiritual influence. How? A- Recognizing that every day is a "holiday" for the Christian, or a holy day rather. We are 24/7 worshiping God, our spirits in His presence. This should impact our day-to-day lives, as much as Halloween alters the lives of those around us. B- "All Saints' Day" is kind of a concept for us to think about. Who are the saints? We are! We have been called Saints, the Called Out. Let this be a reminder to us to be God's people every day. This evening, we will be helping out with a friends' church's outreach program, to shine light on a night that can sometimes be dark. Our costumes? The Light of the World. God bless y'all, and feel free to comment. Writing this short post from Virginia, where we are enjoying visiting family. Just wanted to share this map of our travels this furlough. 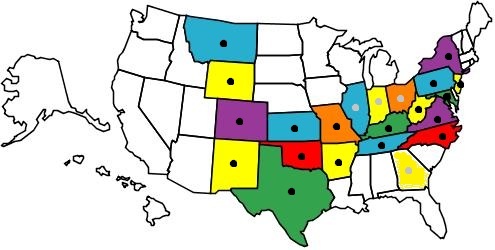 These states that we've visited and/or driven through or will visit before we leave. Those marked with a black dot are where we've already been and may be again. Those with a grey dot are places we are planning to go. Just wanted to praise God, as we've really been having an awesome trip. People's encouragement, prayers, interest, generosity and hospitality never cease to amaze and awe. We will post pictures and more when ever our travels are over, but please keep us in your prayers as we continue our travels. Also, if you see that we are passing, or even have passed through your state and want us to stop and visit, let us know! Or maybe, add your state to the list! God bless and keep you all.